You need to watch this video. Even better, grab (or perhaps invite) your spouse, kids, friends, colleagues, anyone… and watch this. I’m intentionally posting this short entry on a Friday because i assume you probably work hard during the day… so if you cannot watch this on your lunch break, bookmark it and come back to it this weekend. 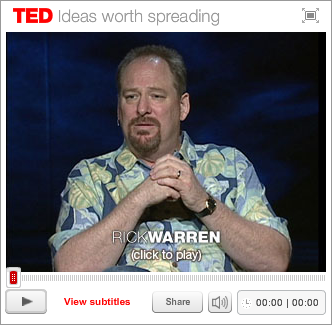 You are probably familiar with Pastor Rick Warren of Saddleback Church. He wrote that somewhat successful book The Purpose Driven Life: What on Earth Am I Here For? that has sold over 30 million copies worldwide. However, you may not be familiar with TED (Technology, Entertainment, Design). TED is a non-profit foundation known for its annual conferences and “TED Talks”. These lectures are given by industry leaders / experts and some of the world’s most influential people, which have included Bill Gates, Bill Clinton, Billy Graham, the founders of Google, various Noble Prize winners, etc. Beware: The intellectual stimulation offered by some of the TED Talks may leave you in a catatonic state with drool splotches on your clothing. It is interesting to note this audience is not necessarily Christian. The audience is eclectic and the majority is probably NOT Christian. In fact, another speaker, philosopher Dan Dennett, gave a lecture entitled “A Secular Scientific Rebuttal to Rich Warren”. We question our gifts and talents in a multitude of ways. We stew in jealousy of others’ resources. We deny or misuse our resources / gifts. We feel we do not have any gifts or do not know what to do with them. We wonder, what are my gifts? Why did God give me these resources? How could the the creator of the universe use me? Why the heck would God care about me and what I do in this life? In Exodus 4, Moses asked God similar questions. God answered him with a rhetorical question: “What is in your hand”? Moses was holding :::drum roll please::: … a stick. Seriously… a stick. However, through Moses’ submission to and pursuit of God, the supernatural stick changed history and humanity. The questions are straight-forward and SIMPLE. Do not complicate this. What is in your hand in life? What resources has God blessed you with and how are you using them? Christ’s also taught on this in the Parable of the Talents in Matthew 25:14-29. Be honest and real with yourself. Be thankful. Do not minimize or overlook any of the resources / gifts with which you have been blessed. Can you talk, sing, read, type, write, negotiate, walk, paint, clean, lift, push, drive, knit, run, cut grass, make people laugh, listen, etc? Do you have position, influence, money, shoes, food, a home, a computer, books, knowledge, transportation, humility, compassion, empathy, etc? These lists are infinite. Have you been blessed with the gift of a spouse? You have double the resources with which to glorify God, serve others, and win the world for Christ through love. Hold each other accountable. Encourage and support each other. Pray through and talk about this with your spouse. Pray for clarity, wisdom, discernment, stewardship, creativity, humility, thankfulness, and more resources to multiply for God. Thank God. Re-prioritize your life as necessary. Impact your marriage. Impact your family. Impact your community. Impact the world. Serve and cherish your God. Go. Do. Now. Exodus 4 … A conversation between God and Moses. 1 Peter 4:10 … Each one should use whatever gift he has received to serve others, faithfully administering God’s grace in its various forms. Romans 12:6-8 … We have different gifts, according to the grace given us. If a man’s gift is prophesying, let him use it in proportion to his faith. If it is serving, let him serve; if it is teaching, let him teach; f it is encouraging, let him encourage; if it is contributing to the needs of others, let him give generously; if it is leadership, let him govern diligently; if it is showing mercy, let him do it cheerfully. Which of the following do you tend to do in relation to the resources with which God has blessed you: misuse, neglect, deny, envy others, etc? Why? Ask forgiveness. Are you managing whatever is in your hand to the best of your ability? How can you improve / multiple? 1. I have been given the gifts of humor, artistry, intelligence, finance (one day), listening, and compassion. 2. I tend to neglect some of my gifts. I have neglected my gift of artistry for the sake of finishing studies in school. I generally do not envy others’ gifts, but there are times that I have when it involved artistry. 3. I do try to manage what has been given to me to the best of my abilities. I know that I fall short often. 4. I can pray that God will show me gaps in my life where my gifts can be used to glorify Him.